The Spinner ® NXT manufactured by Star Trac is our top-of-the-line bike that performs as great as it looks. This commercial bike offers top end specification at an affordable price. The Refurbished Spinner ® NXT manufactured by Star Trac is our top-of-the-line bike that performs as great as it looks. This commercial bike offers top end specification at an affordable price. It's your ride so make it the best with the Spinner® NXT, manufactured by Star Trac®. 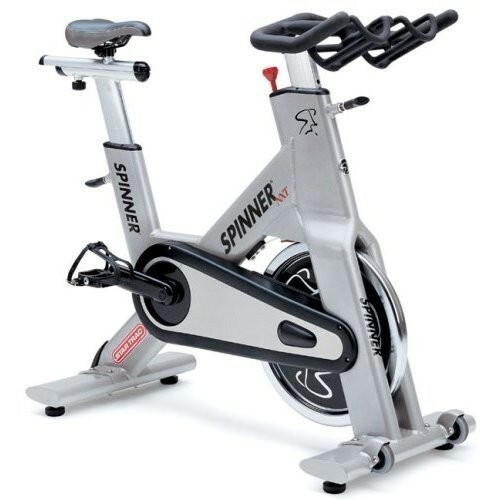 This premium indoor cycling bike combines user-focused features with a high degree of adjustability and comfort. To maintain uncompromising quality ride after ride, the Spinner® NXT features rust-defying two-stage powder coating and rock solid construction for lasting performance as well as an increased five degree handlebar angle for a more comfortable riding position and an improved Q-factor for the most authentic ride. Sleek steel frame design with zinc dip coating for superior rust prevention. Superior bio-mechanics with a bottom bracket Q-factor of 158 mm. 38 lb (17.2 kg) perimeter weighted flywheel for a smooth and realistic riding experience. Smooth control resistance knob with direct pressure emergency stop. Front mounted wheels for easy transport and movement.